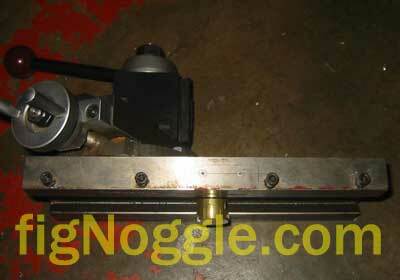 8×12/14 Lathe X-Axis (Cross Slide) DRO Mounted! (267,’2007-01-29 00:23:28′,’david’,’2007-01-29 01:03:56′,’david’,’8×12/14 Lathe X-Axis (Cross Slide) DRO Mounted!’,”,’Finally! We mocked up and made a working prototype of the 8×12/14 cross slide (X-Axis) DRO scale mounting brackets. We knew going into this project that making this work would take some very finite positioning or extending the scale far back from the lathe to make things work. 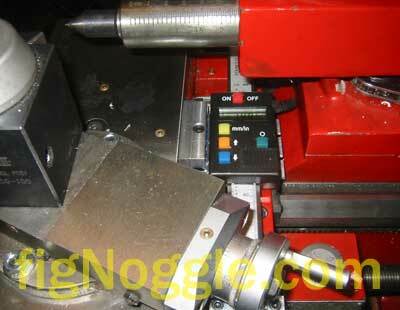 Since space is limited on these mini and small sized lathes, positioning and usability is everything. 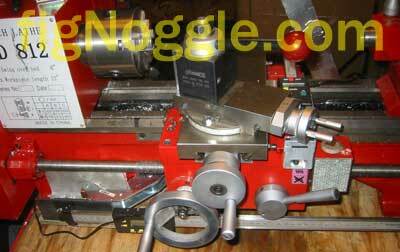 In doing so, we sacrificed an inch or so of distance between the carriage and tailstock. Our design goal was to make the scale readable without an external readout box just in case people didn’t want to spend $200 for one. Also, using a vertically-oriented scale took up more space than a horizontal version of the same length. Using a horizontal one would save more space yet, but would require that you rotate your head to read the scale for cross-slide movement. 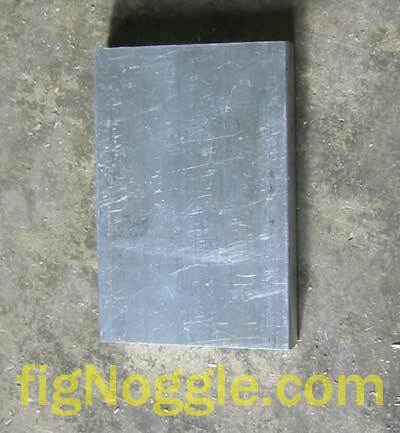 Making the pieces for this came from a single piece of 6061-T6 aluminum bar stock 3/8″ thick and 2″ wide. The total materials cost was less than $5. This piece holds one end of the scale to the carriage. 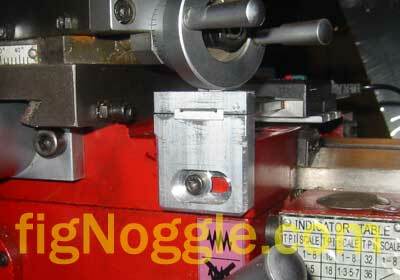 Next, we milled the scale readout bracket and spacer block. 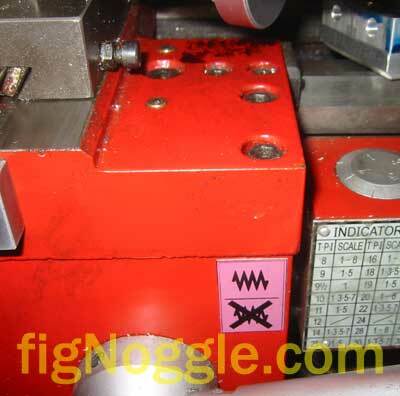 We used the ER-32 collet chuck in the Dayton/Grainger mill-drill (RF-31 clone) and ran into a clearance problem with the collet and drawbar. Luckily, the drawbar is of a soft steel that ended up being threaded into the ER collet to fit. We had to revert back to using a 7/16″-20 die to rethread the drawbar to work again with the R8 collets without resistance. We recessed the slots so that the screws that mount the scale reading unit are flush with the bracket. Here’s where having a larger sized mill makes all the difference. 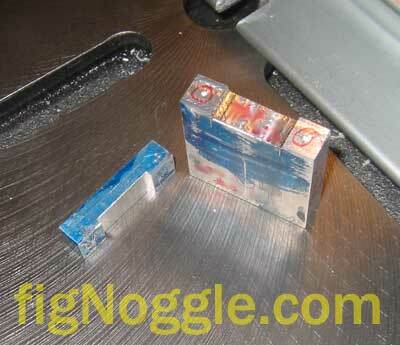 With a 9.5″x32″ table, we just removed the entire cross slide and held it in the Palmgren vise (no Kurt yet..). Then we mounted the bracket to the underside of the scale readout unit and placed that next to the cross slide for general positioning. 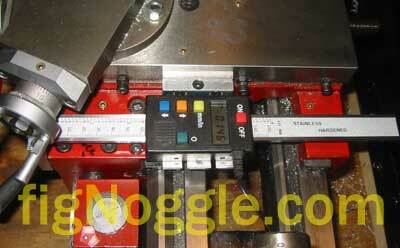 In the end, having DROs in both axes for lathe turning makes all the difference in speed. Now you can quickly get close to dimension and edge up into spec. Having DRO in general is such a time-saver. As an example, it took under a few minutes to bore out a bearing recess. Before the DRO it would take at least twice as long (perhaps longer). Finally! We mocked up and made a working prototype of the 8×12/14 cross slide (X-Axis) DRO scale mounting brackets. 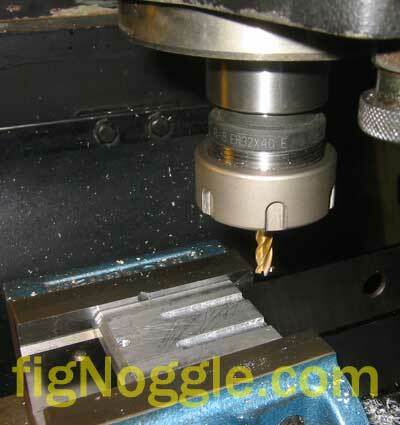 Making the pieces for this came from a single piece of 6061-T6 aluminum bar stock 3/8” thick and 2” wide. The total materials cost was less than $5. Next, we milled the scale readout bracket and spacer block. We used the ER-32 collet chuck in the Dayton/Grainger mill-drill (RF-31 clone) and ran into a clearance problem with the collet and drawbar. Luckily, the drawbar is of a soft steel that ended up being threaded into the ER collet to fit. We had to revert back to using a 7/16”-20 die to rethread the drawbar to work again with the R8 collets without resistance. Here’s where having a larger sized mill makes all the difference. 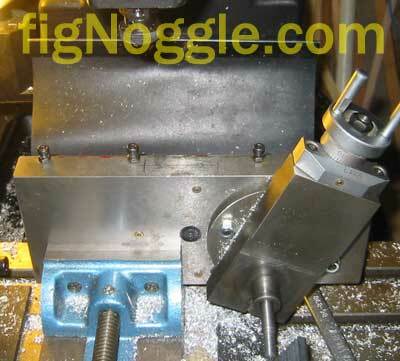 With a 9.5“x32” table, we just removed the entire cross slide and held it in the Palmgren vise (no Kurt yet..). ‘,’Finally! We mocked up and made a working prototype of the 8×12/14 cross slide (X-Axis) DRO scale mounting brackets.